Today, I’ll be looking at two not-too-fondly-remembered movies from the 1980s, both based on toy lines. In both cases, the toys were still a going concern when the films were released, but no longer at the height of their popularity. I guess that’s a tricky thing, as you don’t want to rush out a movie for something that’s just going to be a flash in the pan, but putting it out too late means it might well be ignored. In these two cases, they were terrible movies anyway, so they pretty much HAD to rely on the toys’ popularity to achieve any box office success, and there apparently wasn’t enough. Masters of the Universe – The toy line and cartoon were huge when I was a kid. I didn’t watch it that much, but I remember seeing it occasionally. It concerned the constant struggle between He-Man and Skeletor over the fate of the planet Eternia, a world where nobody was allowed to take more than thirty seconds to come up with a name. The animation was incredibly cheap, but there was a certain amount of real creativity involved. This didn’t really hold true for the movie. There’s an article on how it was made, which mentions that it was mostly set on Earth in order to keep it low-budget, but there was one elaborate (but still cheesy) Eternia set for the beginning and end of the film. Due to technical issues, Battlecat (the character I tend to remember the best) and Orko didn’t appear at all, the latter being replaced with Gwildor, a tiny inventor played by Billy Barty. 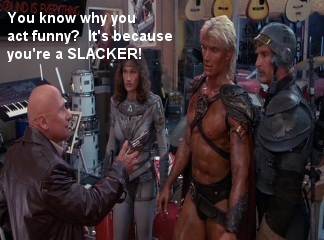 I believe all of Skeletor’s henchmen except for Evil-Lyn and Beast-Man were also specifically created for the movie. 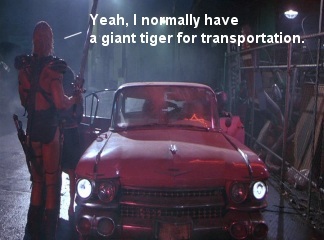 Dolph Lundgren, fresh from killing Apollo Creed, was cast as He-Man because they could afford him and he looked the part. Frank Langella’s Skeletor was appropriately corny and allowed to be more sadistic than in the cartoon, but I have to think a drugstore Skeletor mask would have looked better than what the movie went with. For that matter, a skeleton mask that didn’t have anything to do with the character might have worked better. Also in the movie was Courteney Cox, who would then have been known as the girl in the Bruce Springsteen video. She and her musician boyfriend provided a subplot that tied into the main story due to his having a perfect memory of musical tones. Also roped into the adventure was a cop played by Mr. Strickland from Back to the Future, who ended up staying on Eternia. For a property based on action figures and a cartoon, the film felt incredibly slow-paced. It also seemed to rip off Star Wars quite a bit: Skeletor’s troops wore Vader-like armor, he ends up falling down a shaft exactly like Emperor Palpatine, and even the music is suspiciously similar. The main thing I got out of it was that Skeletor seemed to have a crush on He-Man, which is creepy when you consider that he was hinted in other media to be He-Man’s uncle. Then again, they also didn’t acknowledge that He-Man’s mom, and possibly Evil-Lyn as well, was from Earth. I have to wonder if the implications that Eternia doesn’t have cows and that meat-eating is pretty much unknown there are part of established canon, or just to make the fish-out-of-water aspect of the plot more obvious (although it was somewhat lessened by the fact that everybody spoke English). And at the end when Courteney and her boyfriend are sent back to Earth, she apparently goes back in time to before her parents died. You’d think they would have established that Gwildor’s key was capable of time travel, because that would have come in handy on other occasions. Some of the images I used are from here. The Garbage Pail Kids Movie – Widely acknowledged as one of the worst movies ever made, it somehow actually held my interest better than Masters of the Universe. It was more of an entertainingly bad film, I guess. 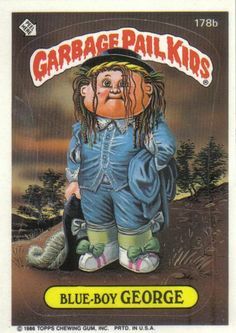 Garbage Pail Kids are another thing I grew up with; I had quite a few of them in second grade, although I ended up giving many of them away after that. A product of the trading card company Topps, they were sort of an extension of the Wacky Packages line, as well as a parody of Cabbage Patch Kids. Based on gross-out humor, puns, and alliteration, they were turned out quite cheaply, but were a pretty ingenious idea. Kids pretty much universally love gags that are as grotesque as possible, and there were occasional hints of wit beyond what kids were likely to get; I remember having to have explained to me what the jokes were behind Bruised Lee, Farrah Fossil, and Didi T. Other cards referenced the Odyssey, Salvador Dali, Vincent Van Gogh, Uncle Sam recruitment posters, and the Coppertone ads with the dog pulling on a girl’s swimsuit. Art Spiegelman, the cartoonist perhaps best known for Maus, a graphic novel involving the Holocaust, was the director on the project, although the art was all uncredited at the time. A few years back, I gave my wife a book with the art from the first five series, with a foreword by Spiegelman and afterword by John Pound, who drew the cards. They point out that, as repulsive as the Kids were, there was still a certain cuteness to them, although this became less prominent after a lawsuit from the Cabbage Patch owners. There are images of all the cards at this website. The movie stars Mackenzie Astin, son of John Astin who was also on The Facts of Life, as Dodger, a frequently bullied kid who hangs out with a magician who owns an antique store. It’s never clear whether the magician Captain Manzini, played by actor and musician Anthony Newley, is actually his guardian or just some guy he’s always around; there’s no hint as to whether his parents are around at all. The Kids come into the story via a garbage can from space that Manzini takes into his shop and warns Dodger not to open, but of course the Kids eventually get out due to an accident. There are seven Kids present in the film: Greaser Greg, Messy Tessie, Windy Winston, Valerie Vomit, Foul Phil, Nat Nerd, and Ali Gator. Exactly how much they’re actually kids seems to vary from one to another, with Phil being a baby, while Greg is more of a small, somewhat immature adult. For some reason, Nat’s main trait is peeing on himself, and I really don’t know what that has to do with nerdiness. The Kids are somewhat ambivalent characters with disgusting personal habits and a tendency toward mischief that’s sometimes borderline psychotic; yet they’re also friendly and helpful to anyone who gives them a chance, and ultimately portrayed as sympathetic characters. I don’t think it’s a coincidence that their actions are pretty reminiscent of those of the Gremlins. There’s even a weird and rather out-of-place bit of attempted social satire, with the Kids being exploited due to their fashion design and sewing skills (yeah, they’re basically sweatshop workers) and locked up in the State Home for the Ugly. It’s like someone working on the project wanted to be John Waters but didn’t have the talent. The movie was rightfully panned, but then again, what would you expect? There are some properties that, no matter how popular, just shouldn’t be made into full-length live-action films. It has the dubious distinction of not being quite as bad as I thought it would be. This entry was posted in Art, Book Reviews, Cartoons, Humor, Uncategorized, VoVat Goes to the Movies and tagged anthony newley, art spiegelman, billy barty, cabbage patch kids, courteney cox, dolph lundgren, evil-lyn, garbage pail kids, gwildor, he-man, john pound, mackenzie astin, masters of the universe, skeletor, the garbage pail kids movie. Bookmark the permalink. I can’t agree with you about MOTU. I love how corny and crappy it is. It’s definitely amusing in spots, but I found it kind of slow. I read that the Skeletor mask was re-used as one of Lt. Worf’s holodeck practice warriors on Star Trek: The Next Generation.